საბინა შიხლინსკაია არის ხელოვანი და კურატორი, რომელიც ცხოვრობს და მუშაობს ბაქოში, აზერბაიჯანი. იგი არის CIMAM წევრი და ხელოვანთა ჯგუფი ლაბირინთის დამაარსებელი. საბინა შიხლინსკაია ბევრი საერთაშორისო სახელოვნებო ღონისძიების მონაწილე და კურატორია, როგორც აზერბაჯანში ასევე მის ფარგლებს გარეთ. თბილისში, გოეთეს ინსტიტუტში, საბინა შიხლინსკაიას პრეზენტაციის თემაა ნაციონალური იდენტიფიკაციის საკითხი აზერბაიჯანულ ხელოვნებაში, რომელსაც იგი განიხილავს აზერბაიჯანიდან თანამედროვე ვიზუალური ხელოვნების რამოდენიმე კონკრეტული პროექტის მაგალითზე, რომლებზეც საბინა ახლა თავად მუშაობს როგორც ხელოვანი და როგორც კურატორი. Sabina Shikhlinskaya is an artist and curator, lives and works in Baku, Azerbaijan. She is member of CIMAM, founder of Labirynth Art Group, participant and curator of numerous international art events in Azerbaijan and abroad. 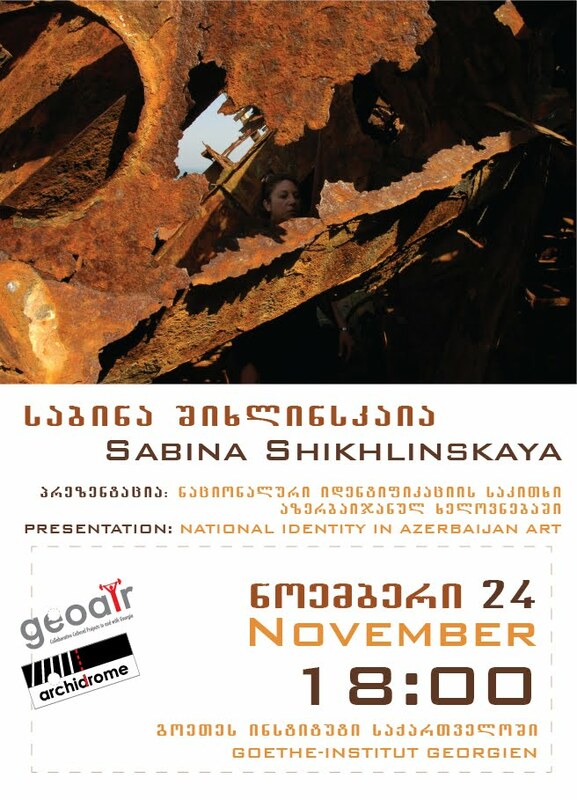 Topic of her presentation at Goethe-Institut is a subject of questioning of national identity in Azerbaijan art, through the demonstration of some of the projects of contemporary visual art from Azerbaijan on which Sabina is currently working as an artist and as a curator. აზერბაიჯანელი ხელოვანი, პედაგოგი და კურატორი საბინა შიხლინსკაია (დაიბადა 1962 წ.) 1993 წლიდან 50 საერთაშორისო და ეროვნული საგამოფენო პროექტის ავტორია, მათშორის 2007 წელს ვენეციის 52-ე ბიენალეზე პირველი აზერბაიჯანული პავილიონის კურატორი, 2008 წ. გამოფენა “USSR – Remix”, 2009 წ. თანამედროვე ხელოვნების საერთაშორისო ფორუმი “Maiden Tower”, 2010 წ. ვიდეო ხელოვნების გამოფენა “Openly” “Istanbul 2010 – Capital of Culture of Europe" ფარგლებში. 2010 წ. “USSR-Remix”- ის ახალი ვერსია ნორვეგიაში. 1996 წელს მან დაიწყო პროექტი “ლაბირინთი”, რომლის წარმატების შემდეგაც, შიხლინსკაიას ხელმძღვანელობით მასში მონაწლე 12 ხელოვანისგან ჩამოყალიბდა არტ ჯგუფი ლაბირინთი. 2005 წ-ს აზერბაიჯანის მე-2 საერთაშორისო ბიენალეს ფარგლებში შიხლინსკაიას კურატორობით ჩატარდა პერფორმანსი ლაბირინთის ჯგუფის მონაწიელობით. 1996-2005 წლებში კურატორული მოღვაწეობის პარალელურად საბინა შიხლინსკაიამ დაარსა საბავშვო სამხატვრო სკოლა, ასწავლიდა ბაქოს ევროპულ ლიცეუმში და TISA-ში, აზერბაიჯანის საერთაშორისო სკოლაში. იგი ასევე ატარებდა ხელოვნების თერაპიის კურსს დაუცველ ბავშვებთან. თავისი პროექტების განსახორციებლად საბინა შიხლინსკაია თანამშრომლობს ისეთ ორგანიზაციებთან ,როგორებიცაა გუგენჰაიმის მუზეუმი, UNDP, UNESCO, UNIFEM, ფონდი ღია საზოგადოება, Appolonia Art Exchanges, აზერბაიჯანის კულტურისა და ტურიზმის სამინისტრო, აზერბაიჯანის ახალგაზრდობისა და სპორტის სამინისტრო, აზერბაიჯანის თანამედროვე ხელოვნების ცენტრი, აზერბაიჯანის მხატვართა კავშირი, აზერბაიჯანის სამხატვრო მუზეუმი, ასევე საფრანგეთის, იტალიის, გერმანიის, ნორვეგიის და იაპონიის საელჩოს კულტურის წარმომადგენლობებთან. Since 1993 artist, educator and curator Sabina Shikhlinskaya (d.o.b. 1962) has organized more than 50 exhibitions and projects in both Azerbaijani and international venues. In 2007, Sabina Shikhlinskaya was the curator of the Azerbaijan’s 1st pavilion at the 52nd Art Biennale in Venice. In 2008, Shikhlinskayacurated a group exhibition “USSR – Remix”. Later that year, “USSR – Remix“ was exhibited in Dresden Museum of Art along with another group show curated by Shikhlinskaya - “Steps of Times”. In 2009 Sabina Shikhlinskaya organized “Maiden Tower”, the international forum of contemporary art. In 2010, she curated international video art exhibition “ Openly” shown in Istanbul, Antrepo in the frames of “ Istanbul 2010 – Capital of Culture of Europe”. In 2010 Shikhlinskaya presented new version of “USSR-Remix” group exhibition project in Norway. In 1996, Shikhliskaya launched the “Labyrinth” project in Baku. Following the success of this project, the twelve participating artists, under the leadership of Shikhlinskaya, formed the Labyrinth Art Group. In 1999, Sabina Shikhlinskayacurated the first land art project in Azerbaijan with the artists from the Labyrinth Art Group. 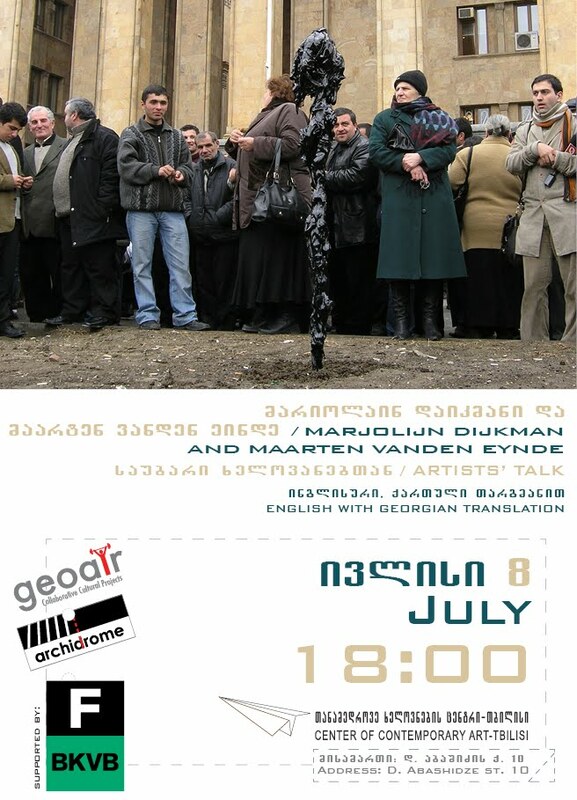 In 2005 within the framework of- Azerbaijan’s second International Biennial of Contemporary Art, Sabina Shiklinskayacurated a public performance of the Labirynth Art Group members. Between 1996 – 2005, alongside her curatorial activities, Sabina Shikhlinskaya undertook a number of educational art projects in various institutions. She founded a school of painting for children, taught art in European Lyceum in Baku and TISA, the International School of Azerbaijan. She also conducted art therapy courses for vulnerable children. 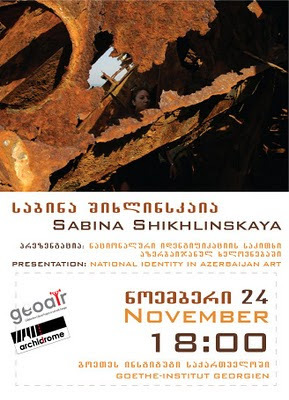 In both her educational and curatorial projects, Sabina Shikhlinskaya partnered with such organizations as the Solomon Guggenheim Museum, UNDP, UNESCO, UNIFEM, Open Society Institute, Appolonia Art Exchanges, Azerbaijan Ministry of Culture and Tourism, Azerbaijan Ministry of Youth and Sports, Azerbaijan Center for Contemporary Arts, Azerbaijani Artists Union, Museum of Fine Art of Azerbaijan, as well as cultural representations of French, Italian, German, Norwegian, and Japanese embassy missions in Azerbaijan.